Today I have an easy recipe for you that yields a delicious treat for your family and friends during this Christmas time. I have been baking these cookies since last year when one of my blogger friend who posted this on her blog. I couldn't resist baking these cookies right away and it turned out to be a keeper. Last year I made some edible gifts with these cookies. This cookie is my little one's favorite. I am sure you will love it too. I want to keep this post short and sweet. 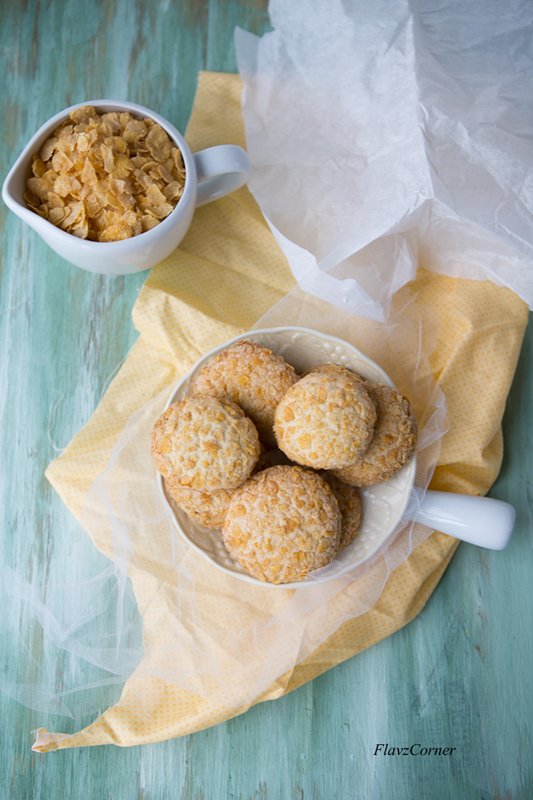 Bake this yummy treats and enjoy. Wishing everyone a Happy New Year!!! Sift flour, corn flour and baking powder in a mixing bowl and stir until combined. Cream butter and Sugar for few minutes until fluffy in the mixing bowl of a stand mixer using paddle attachment or using an electric hand mixer. Add the egg and vanilla and beat well till creamy. Add the flour mixture to it and beat till combined. The dough will be slightly sticky. If it is hard to handle, cover it with a plastic wrap and refrigerate for 15 - 20 minutes to set. Make balls using 1 tbsp. of the dough for each cookie and gently press them between your palms to flatten. Roll them in crushed corn flakes. Place them on a baking tray lined with parchment paper with enough spacing so that they get room for expansion. Bake them for 25 - 30 minutes. Cool them on wire rack and store it in air tight container. 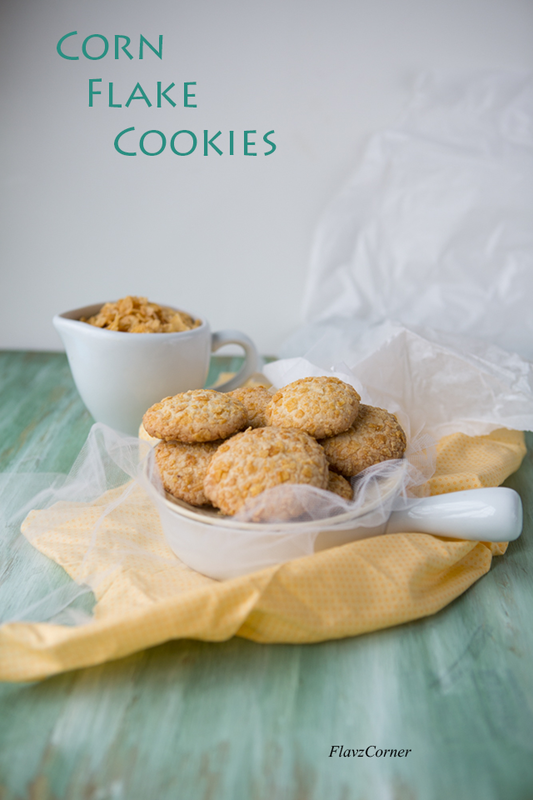 These cookies will stay fresh for 2 weeks at room temperature in air tight containers. I bake them for 30 minutes, so that they turn out little crunchy and crispy and this helps to keep them longer. If you are making small cookies, 25 minutes of baking will be enough. Depending upon your oven and the size of the cookies, the time may vary. So keep an eye on the cookies after 20 minutes. Corn flakes cookies looks yummmm. I always love cornflake cookies. These look so tempting! I want to wish you and your family Shibi a blessed & healthy New Year! Lovely recipe! Easy, and really tasty. Thanks -- and Happy New Year! The cookies look pretty with those dotted cornflakes and love that first click. 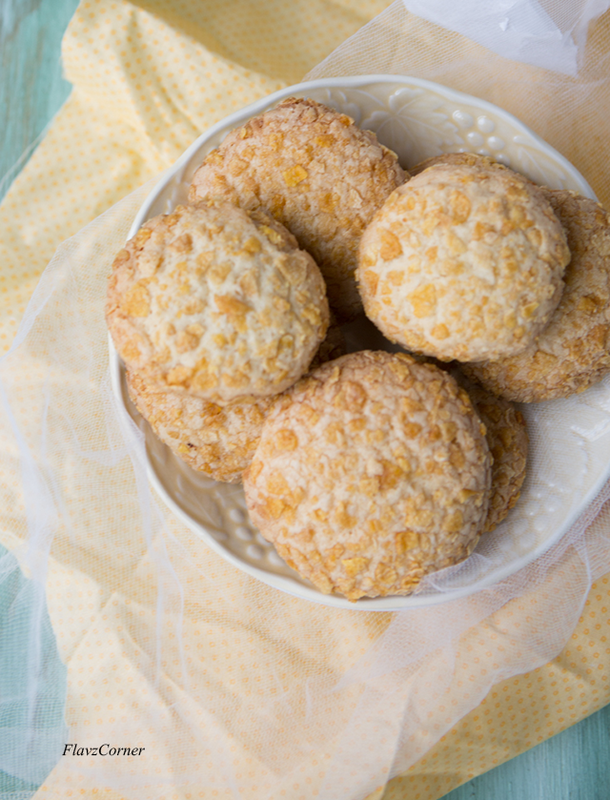 You might be using plain unsweetened cornflakes for these cookies right? I have the Kelloggs Yogurt flavor or something, that is slightly sweetened...can we use those type as well?